Just one example of the many giant diamonds recovered at the Karowe Mine in Botswana. 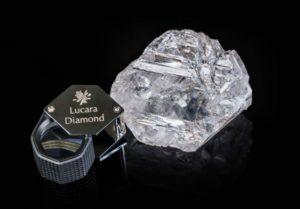 Source: Lucara Diamond Corp.
Lucara Diamond Corp. [LUC-TSX, BOTSWANA, NASDAQ OMX Stockholm] announced that following the close of the fourth Regular Tender of 2016, the company exceeded $1.0 billion in accumulated sales since the start of production in June 2012. The company has a 100% interest in the Karowe diamond mine in Botswana, Africa. The Company sold 14 exceptional stone at over $2 million per stone (including 4 stones at over $10 million per stone). Additionally, the company sold 20 exceptional stones between $1 and $2 million per stone.